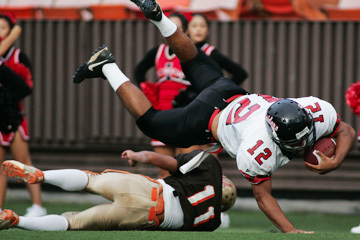 Quarterback Kiran Kepo'o and the Iolani Raiders face Moanalua tomorrow. The hubbub began at the coaches meeting, this whole notion of Iolani hosting a game in the Division II bracket of the HHSAA/First Hawaiian Bank State Football Championships. It made sense. After all, the other seeded team in D-II, was Radford. The Rams were allowed a chance to host, and they'll play Kamehameha-Maui tomorrow at 7:30 p.m.
Iolani, though, was left with "Oahu site" as the location until the coaches meeting. That's when the Raiders asked for an opportunity to host their semifinal game at Eddie Hamada Field. By asking, Iolani received. The Raiders, who will truck bleachers in, will kick off with Moanalua tomorrow at 2 p.m.
Moanalua, which outlasted Kamehameha-Hawaii 34-20 in the tourney opener last week, isn't crazy about playing at Iolani's home field. The Menehunes, however, may have some clear advantages. They've been active through the OIA playoffs and state tourney so far without any key injuries. Quarterback Stanford Leti took his share of hits last week, but delivered many decisive blows, including a 55-yard touchdown run on a mid-line keeper. In addition, Iolani hasn't seen much option football this year, and Moanalua has mastered it since the arrival of coach Arnold Martinez. All in all, the matchup of Moanalua's patient option attack and Iolani's potent run-and-shoot is quite a contrast for fans. If anything, with Iolani's grass surface feeling the brunt of fickle weather and late-season trampling, a below-par surface helps the running team. "Football is football, they're under the sun like us, and they don't have a lot of kids just like us," said Martinez, who began the transformation of Menehune football with discipline and tough love. Playing in the afternoon -- Iolani's field doesn't have lights -- is a throwback. "I like the night games better with the atmosphere and everything else. We haven't played at all in the day, and they've done it twice. But we practice in the day," Martinez said. Here's a look at tomorrow's Division II pairings. On paper: Iolani quarterback Kiran Kepo'o, a Star-Bulletin first-team pick last season, has few peers. His poise and patience in the Raiders' no-huddle, run-and-shoot are impeccable -- especially considering the fact that he's bigger than any of his linemen. Leti is arguably the best option quarterback in the state, converted to the position as a sophomore. He's also one of the strongest of the Menehunes in the weight room, which partly explains his success in the open field. Skinny: Iolani's three-week break since winning the ILH D-II title has been a godsend. The 57-49 title-clinching win over Damien capped a season of wear and tear. "A lot of people were concerned and asked about that, but knowing this team, we needed that break," Iolani coach Wendall Look said. "Coming off a physical ILH season was taxing on our bodies. We needed that break mentally and physically, to get refreshed. The maturity of this group, when we came back from taking some days off, they were focused on what we need to do. It's almost like the colleges playing bowl games. The Raider defense, with linebacker Jon Tokumura healed up from minor injuries, will need to be at full speed to keep up with Leti and shifty slotback John Estores. Moanalua's defense, meanwhile, saw a talented passer in Kamehameha-Hawaii's Mana Silva. The Menehunes were willing to play zone defense and give Silva room to scramble, which turned out to be a winning recipe. The Menehunes feel relatively comfortable facing passing attacks, since half of the OIA White ran run-and-shoot offenses. Kaiser, for example, ran a clone of Iolani's attack. "Pat Samsonas was at Iolani for six years," Martinez said of Kaiser's first-year coach. "Radford does that zone offense with the option, and Waialua does an empty backfield. Most of our conference tries to pass. The only teams that run are Campbell, Waipahu and Radford." Look recalls a nonconference opponent when he watches Moanalua. "Offensively, their setup reminds me of Capital (Wash.). I guess, you know, it's not going to be foreign, but that was a long time ago with different personnel." Damien's Kealoha Pilares ran for 300 yards in the loss at Iolani three weeks ago. Leti gives Look similar concerns. "It's gonna be like us going against Damien, trying to stop their main guy, which we didn't do a good job of against Pilares," Look said. "Now we need to stop Leti. "He is a helluva ballplayer. He's a threat both running and passing. You gotta pick your poison. He runs so well, he's hard to bring down and very accurate throwing the ball." X factor: Quinton Tang can change the course of a game on either side of the ball. As a linebacker, few are quicker off the snap, and he seems to enjoy making the life of a quarterback miserable. As a running back, he runs for tough yardage up the gut, but has become fumble-prone in recent weeks. "(Tang) is very active, a lot like some of the ILH 'backers. He makes a lot of plays and they rely on him a lot," Look said. "He plays the run and pass really well. A very smart player. He does a good job of moving around. He'll move toward the line of scrimmage, outside, inside, always around the ball." Summary: The Raiders love the no-huddle, but that doesn't mean they're in a hurry. "I think you keep their offense off the field, so on offense, we'd like to keep the ball." Look said. "Weather is a big factor." On paper: Of all the Kamehameha campuses, the biggest surprise in football may have been in up-country Maui. After all, Kamehameha's Kapalama campus was home to the defending D-I state champ. The KS-Hawaii squad won the Big Island Interscholastic Federation D-II title, but lost at Moanalua, which leaves KS-Maui. The MIL D-II champs finally broke through with a win at midseason and has torn up foes since. Last week's come-from-behind 14-7 win over Kauai may have been the most impressive in the brief football history of the Pukalani campus. Keahi Raikes (6-0, 160) had some struggles in the air during the MIL season, but completed 13 of his 18 attempts for 132 yards against Kauai. KS-Maui's switch from the ground to an air-oriented spread formation turned the game around. "We have used the spread at times. Teams in the MIL know we like to run the ball, so when they stack eight, nine guys on the ball, we keep them honest," coach Leo Delatori said. "We kind of took advantage of something they weren't prepared for." Rocky Keawekane (5-6, 145) and Keaton Tam (5-9, 155) led the Warriors with identical statistics of four catches for 44 yards. Robert John Kukahiko (5-9, 195) caught the deciding touchdown pass. The skinny: Count on Fred Salanoa's Radford team to be fully prepared for anything KS-Maui offers. The Rams, with size in the trenches, will be the biggest team KS-Maui has seen. Defensive end Russell Wantkowski (6-0, 210) leads a stalwart unit that allowed just seven points in two OIA White playoff games. Radford's ground attack gives slippery Alex Daniels (5-7, 155) a chance to use any of his behemoth blockers to get an opening. Once he gets to the perimeter, few defenders can catch the speedster. "For us, it's difficult. In the MIL, there's nobody that has that kind of size up front. We'll try to do the same thing, get people to the ball as quickly as we can and disrupt what they're trying to do," Delatori said. "Our concern is that they have a big line and our defense might lose track of (Daniels)." That Radford O-line is led by Ramsey Feagai (6-2, 320). Their consistency will help the Rams adjust to a new signal caller. Radford lost quarterback Ryan Burciaga to a collarbone injury in the OIA White title game. Justin Lord (6-0, 175) will step in. "And knowing that they're gonna have a different quarterback, we don't know what they're going to present," said Delatori, a counselor. X factor: Jamie Whitworth has one of the most powerful legs in the state. The junior place-kicker gives the Rams a huge advantage on kickoffs and field goals. Summary: Playing at John Velasco Stadium gives the Rams a big boost, but KS-Maui has proven its ability to play well on the road. Another unexpected win by the Warriors means Cinderella will wear blue to the final dance.